OCEANSIDE — Twenty-six-year-old Zack Beck serves as Oceanside city clerk. He is also a youth pastor at Gateway Community Church, among other obligations, and opens City Council meetings with a prayer before diligently recording meeting minutes. Beck manages the $1.8 million department, where he oversees nine employees, balances the department budget and provides requested public records. Prior to Beck taking on the part time position, Barbara Riegel Wayne served as full time city clerk for 32 years. Wayne was paid $139,830 her final year in office before her retirement in 2012. Her responsibilities also included the day-to-day operations of the city clerk office that are now covered by full time staff. The duty of city clerk recording minutes of City Council meetings has remained the same. This is not Beck’s first involvement in politics. He ran for city council in 2008 because he wanted to help the community and serve the diverse needs of citizens. A handful of core supporters helped him knock on doors, pass out flyers and run his campaign. Beck’s run for office put him immediately in the political hot seat. He ran against seven other candidates including Chuck Lowery for two seats on the City Council and took part in numerous forums in which he had to state his political beliefs and develop a candidate profile. Beck lost, but gained experience in campaigning. Beck continued a close friendship with Lowery. In 2010 Beck served as Lowery’s campaign manager during Lowery’s run for city council in the June special election. After a successful race Beck took the position as Lowery’s council aide. Beck said serving as council aide gave him insight into public policies and provided him the opportunity to have daily communication with constituents. five months. Beck helped Lowery again in his re-election campaign, which Lowery ultimately lost. Between 2008 and 2010 Beck completed his bachelor of arts degree at Cal State San Marcos, took on the job as store manager of Surf Ride, and served as youth pastor at Coastline Community Church. “A lot of great things happened,” Beck said. In 2012 he ran for city clerk with Lowery by his side as campaign manager. Beck ran a low-budget grassroots campaign. “I passed out 1,000 door fliers and waved signs at 1,000 cars,” Beck said. 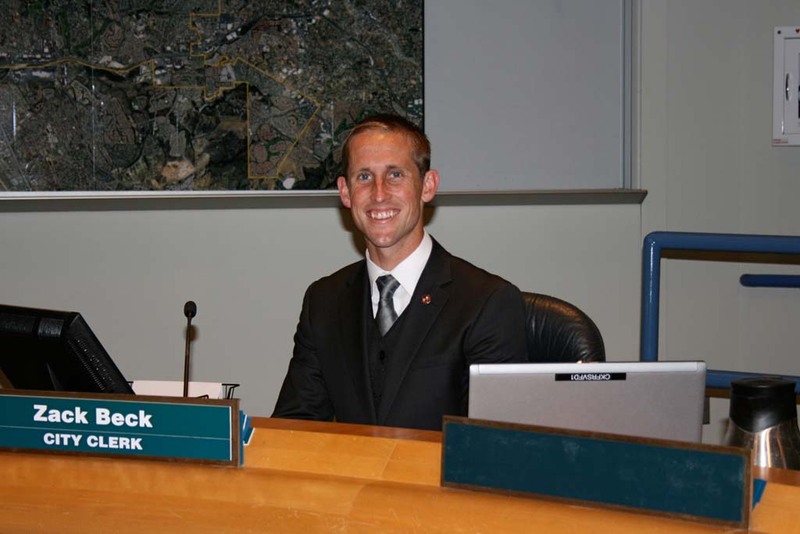 Beck was elected into office in November 2012 and sworn in Dec. 5. The job is 20 hours a week and pays $24,000 annually. Beck said city staff members were very supportive and things went smoothly from the first days on the job. “I came into the job open minded with a willingness to run things as efficiently and streamlined as possible,” Beck said. Last year Beck also got married to his wife Megan. They work as youth and children pastors at Gateway Community Church. “It’s an exciting time,” Beck said. Beck continues to serve as city clerk, pastor and store manager. He said each job gives him perspective for his other roles. Beck said he would serve his term as city clerk through 2016. After that he would evaluate his options and decide whether his calling is to continue to serve in the public, nonprofit, or private sector.